Micellar water has become a staple in my beauty routine, I’d honestly be lost without it. But with so many on the market these days, which do you opt for? Bioderma Sebium (£9.99) was one I purchased after hearing much hype, and for the most part I am happy with its performance. I’ve noticed though over the last few months though it does sting my eyes so I have to be really careful, which is not really what you want when you’re trying to remove makeup. I can’t vouch for Sensibio or any others in the range as I haven’t tried them but certainly the Sebium one doesn’t seem to agree with my eyes. 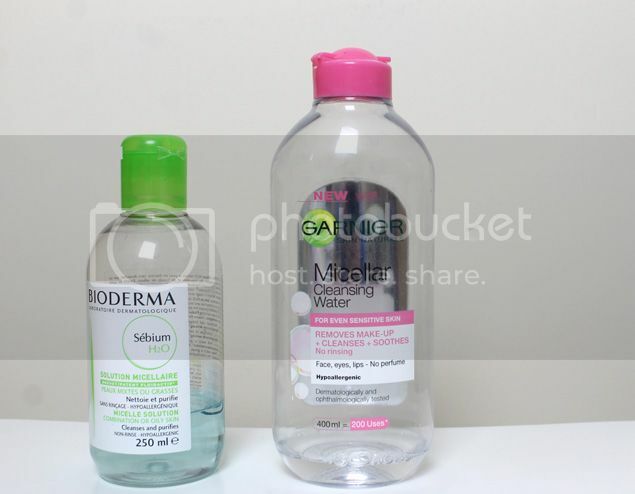 I stuck with Bioderma for so long, as there hadn’t been any budget options that matched up to the efficacy of Bioderma, but then along came Garnier Micellar Cleansing Water (£4.99). The Garnier one is actually a bigger bottle at a whopping 400ml compared with Bioderma’s 250ml so it’ll last you longer. It’s also half the price of Bioderma and does just as good a job without stinging your eyes. Formula wise they’re both hypoallergenic with no soap, alcohol or colouring. The Garnier one is odourless as opposed to the Sebium which has a smell of baby wipes, which I believe is probably the Gingko Biloba extract. However I don’t believe the others in the range have a scent so don’t let that dissuade you from the brand. Neither have an extensive ingredients list, although the Garnier one has some scary looking long-named ingredients (polyaminopropyl biguanide anyone?). So what’s the verdict? Personally? I’d go for the Garnier one. It’s every bit as good, plus I get more bang for my buck and doesn’t sting my eyes. However if you’re desperate to try the much coveted Bioderma, then definitely stock up when it’s on offer at Escentual. While I like the Garnier one, I detest the smell, as it reminds me of mold. I tend to reach for other products instead. It really does reek of mould!